For more than 60 years, our organization has been guided by a mission to provide the best medical care for community residents and visitors. Aitkin Community Hospital, incorporated in 1948, was promoted by a dedicated group of local citizens as an investment—not only in better health but to help the community grow and prosper. To move ahead with the construction of a hospital the community needed to raise several thousand dollars. A grassroots fundraising campaign urging every Aitkin County household to make a donation produced an amazing response in a few short years. 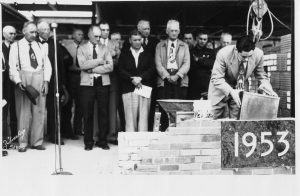 In 1953 the hospital cornerstone was laid and construction was completed by the end of 1954. In January 1955, the community celebrated with a grand opening. Over the years, the hospital has grown into an integrated health system—a 25-bed hospital and three primary care clinics in Aitkin, Garrison and McGregor. Building a reputation as a trusted leader, Riverwood has become known for its genuine caring and high quality services. 1953: Hospital construction began at the site on Minnesota Avenue. 1954: Plans for a Women’s Auxiliary began with objectives to create good public relations, serve as volunteers and raise funds. By December 1954, the Auxiliary had 1,000+ members! 1955: The hospital opened its doors to patients and hosted an open house on January 9. 1963: In July 1963, the first patients were admitted to a 48-bed facility added on to the hospital. 1977: Riverwood began serving McGregor area patients at the local clinic. A facility expansion is completed in 1979 for more dedicated space for outpatient services, surgery and emergency services. 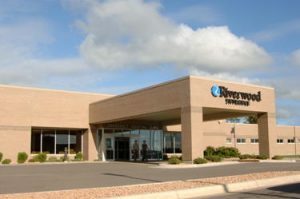 1990: Aitkin Community Hospital changed its name to Riverwood Healthcare Center to reflect the integration of inpatient and outpatient services and their delivery to more patients in a wider geographic area. 1992: A Foundation was formed to develop and coordinate a capital campaign to raise funds for future expansion and renovation of hospital facilities and services. 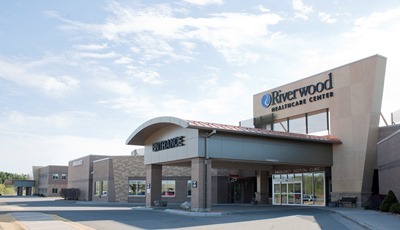 1998: Riverwood purchased the Ripple River Medical Clinic to form an integrated hospital and clinic system for inpatient and outpatient care. 1999: The newly remodeled Riverwood McGregor Clinic opened. 2001: Riverwood broke ground for construction of the Bunker Hill campus hospital and clinic, building one integrated healthcare facility at a cost of $19 million. 2003: The newly built hospital and clinic in Aitkin opened in January. 2004: Riverwood’s Foundation developed a Healing Garden to offer a place for reflection and honoring loved ones with bricks, flowers and more. 2006: Two major expansion projects for the Specialty Clinic in Aitkin and the McGregor Clinic reached completion. 2007: Riverwood opened a third primary care clinic with a retail pharmacy in Garrison, and in 2008 added an adjacent outpatient services building. 2009: The hospital opened an Imaging Center addition with a permanent MRI machine. 2011: Riverwood broke ground for a $21 million hospital expansion project, including a transition from semi-private to all single occupancy patient rooms. 2012: Three new additions opened—the inpatient unit, a center for infusion/chemotherapy services, and a wing for support services named for Michael F. Ryan to honor his outstanding leadership as a long-time Governing Board chair and member. 2013: The hospital expansion project reached completion, which included major renovations to several departments, including rehabilitation and surgery, along with a makeover of the main lobby. 2017: Riverwood launched an expansion project for its Aitkin clinic to add kidney care and dialysis, to expand space for specialty care and to renovate the primary care clinic to support a team-based model of care.